American humorist , which is the pen name of pen name of Henry Wheeler Shaw. 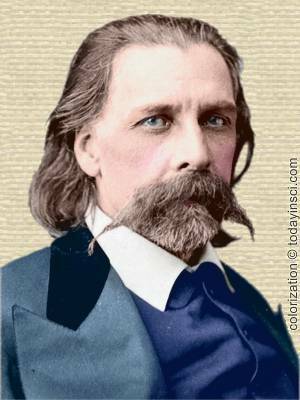 Through newspaper pieces, books, and comic lectures, he delivered his philosophical comments. His rustic aphorisms were written with misspellings, poor grammar, and questionable logic. Common sense is the favorite daughter of Reason, and altho thare are menny other wimmin more attraktive for a time, thare is nothing but death kan rob common sense ov her buty. In The Complete Works of Josh Billings (1876), 214. Common sense iz like biled vittles, it is good right from the pot, and it is good nex day warmed up. 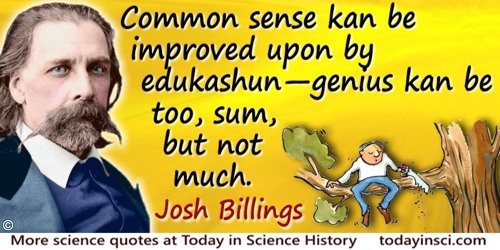 Common sense kan be improved upon by edukashun—genius kan be too, sum, but not much. Edukashun gauls genius like a bad setting harness. If every man waz a genius, mankind would be az bad oph az the heavens would be, with every star a comet, things would git hurt badly, and noboddy tew blame. Menny people are limiting after uncommon sense, but they never find it a good deal; uncommon sense iz ov the nature of genius, and all genius iz the gift of God, and kant be had, like hens eggs, for the hunting. There is nothing that haz bin diskovered yet, that iz so skarse as good Hoss sense, about 28 hoss power. In The Complete Works of Josh Billings (1876), 219.